YOU CAN SEND US YOUR MEASUREMENTS BY E-MAIL OR OUR FORMS LISTED BELOW. THE BEST WAY TO GET MEASURED IS BY GOING TO A LOCAL TAILOR. THEY KNOW HOW TO MEASURE PROPERLY. WE KNOW SOME VERY GOOD TAILORS JUST E-MAIL US YOUR POSTAL CODE AND WE CAN REFER YOU TO SOMEONE IN YOUR AREA. IF YOU DON'T HAVE A LOCAL TAILOR HAVE SOMEONE ELSE MEASURE YOU. IF YOU NEED A CLOTHING TAPE MEASURE E-MAIL US WILL SEND YOU ONE FOR FREE! IF YOU ARE NOT SURE HOW TO MEASURE JUST DOWNLOAD OUR HOW TO MEASURE FORM. YOUR REAL HEIGHT AND WEIGHT IS VERY IMPORTANT. (WE NEED THIS INFORMATION TO MAKE SURE YOUR MEASUREMENTS ARE WITHIN STANDARDS). WE WILL CONTACT YOU BEFORE WE START YOUR UNIFORM. 3) Just a reminder an experienced Tailor would be preferable. HEIGHT Your height is very important as we need to know how long your clothing has to be. WEIGHT Please be accurate, we know everyone likes to adjust their weight but even a few pounds can change the fit of a made to measure garment. Remember we are making clothing to fit you, we want them to fit properly as well. NECK Take the measurement around the neck and follow your shirt line. CHEST Place your arms by your sides and keeping the tape measure level and go around the largest part of the chest under your arms. 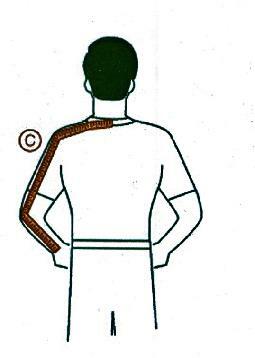 Watch out for your shoulder blades make sure the tape is level. INSIDE SLEEVE. This measurement is from the armpit to anywhere between the base of the thumb to the wrist. COAT LENGTH This measurement is from the bottom of the collar to the bottom of the jacket. UPPER STOMACH Make sure the tape is level and go around the largest part of the stomach right over the belly button. WAIST This is where you wear your pants. The tape measure should feel snug, but not tight. Make sure you have proper pants on, uniforms are a conservative cut and are not "low riders"
SEAT Measure the largest part of the seat area leave the tape level and loose. OUTSEAM Make sure the pants are in a comfortable position and you are wearing the proper footwear. Measure along the sideseam from the top of the waistband to the floor and minus 1"
INSEAM Measure from the crotch to the floor and minus 1"
KNEE The knee measurement is for people that like their pants loose or snug around the thigh. Just put + 1" or 2" for looser pants and minus -1" for snug pants. For people that like their pants baggy add at least 3"
BOTTOM Just like the knee this is either plus or minus 1"